At AV Sierra Dental Center, our highly skilled, dedicated, and compassionate team of dental professionals work alongside Palmdale dentists Drs. Oh and Couto and are committed to making sure you experience excellence in dental care every time you visit. The team will make sure your needs are met and your expectations are surpassed, from the moment you step through our doors until you are done checking out, and they will always give you a reason to smile. Jane, our treatment coordinator, has been in the dental industry for over 15 years. 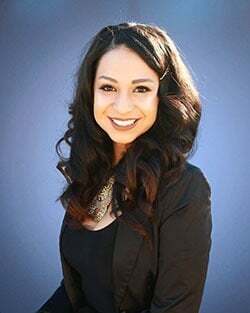 She gained experience and training from the USC Herman Ostro School of Dentistry working with highly respected and well known dentists among the industries best. She always has her patient’s best interest at heart and looks for the best possible way to help them out. She takes pride in her work and enjoys educating patients about treatment options so they can have a better understanding of what to expect, both financially and clinically. In her free time, Jane enjoys spending time with her loving husband Steven and two beautiful daughters Jennalise and Mikaela. She is a huge sports fan and enjoys outdoor adventures and travel. 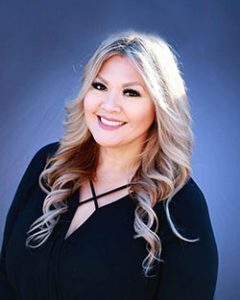 Christina began her journey into dentistry in the year 2000, by attending Santa Clarita Career College dental assisting program. She then went on to earn her degree through San Joaquin Valley College’s Dental Hygiene program in 2007. She also has become AMD Laser Certified. She started in this practice in 2009 and has watched it grow and plans to retire with the doctor. She values being a part of an amazing team and having the ability to help everyone love their smile again. With her patients, she encourages them for their best oral health and loves building great rapport with all of them. A California native, she loves spending time with her family. She especially loves spending time with her son, Jaxon, who is an active kid that keeps her on her toes. Family is everything to her. Baseball is a big part of her life. She is the team mom for her son’s T-ball team. She has always played softball throughout her life and still plays on a softball team with her husband Jaime. 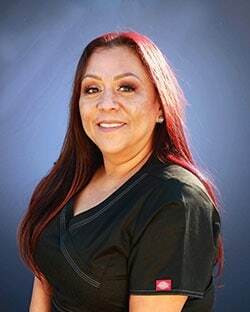 Lupe attended dental school at Valencia College and has been working as a dental assistant for the past 25 years. 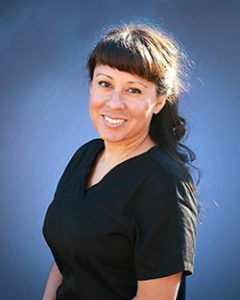 She knew she had found her dental home when she took the job working at AV Sierra Dental. From the excellent team dynamic to the focus on providing superior patient care, Lupe has found a perfect fit for her skillset and work ethic. Outside of work, Lupe is a single mom to six children and one granddaughter. She spends every second of her free time with them and prioritizes giving them the life they deserve both now and in the future. Vicky loves dentistry and has been in the dental field for many years, though she won’t specify for fear of aging herself. 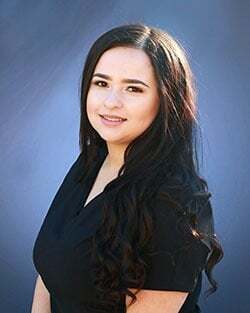 Her current responsibilities include marketing, insurance and as she likes to say, “spreading glitter in the office.” She loves to meet new people, getting to know patients and having the opportunity to build relationships over time in a fun atmosphere. Outside of work, Vicky loves camping, football and spending time with family and friends. 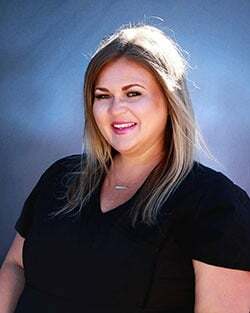 After struggling with whether to pursue a career as a registered nurse or as a dental hygienist, Sivenn decided that the dental field was the best fit with her passion for helping people live a proactively healthier life. She went on to complete four years of dental hygiene school, and upon graduation began working as a dental hygienist. She has continued on in her profession and has enjoyed helping patients for over five and a half years. Sivenn loves interacting with her patients and making a difference in their daily lives. Outside of the office she works out five to six days a week and spends time with her son every chance she gets. Dolores has been in the dental field for 18 years. 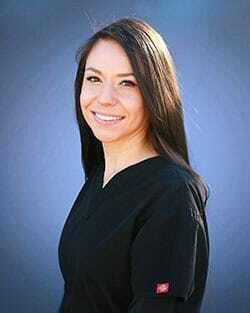 She graduated from Santa Clarita College in 2000, and is passionate about dentistry. Dolores strives to give the best quality care to each patient that walks in the door. She is very active in her church and enjoys spending quality time with her beloved children and husband. Jennifer, also known as Jenny, joined our team in 2014. She has been an active part of the dental field for over 10 years. After high school she wasn’t sure which direction to go. On a whim, decided to try out the dental field and loved it. She started out on her path locally by studying at CCI as a dental assistant, where she quickly became passionate about dentistry. Behind her beautiful smile is a woman who is passionate about getting to know all of our patients and making sure they receive quality service and attention from our front office to the back office. Outside of work, she loves spending quality time with her beautiful little family. Jennifer is married to her high school sweetheart and she has two little ones at home that keep her busy. She has a love for music, art and the great outdoors.